Feeling sick, tired or rundown? then this is the soup for you. I woke up this morning feeling crap. Sore throat, sneezing, coughing up gunk. My teenage son was feeling the same, although the debate was on as to who was feeling worse. So, I decided we needed a healthy soup full of superfood leafy greens and vitamins to boost our immune systems and fight the virus that had invaded our bodies. Time to get creative in the kitchen. It had to be reasonably quick and easy to make, because, remember, I was feeling pretty yukky. Having done a fair bit of research on what qualities various vegetables and spices have for boosting the immune system, see below for more information, I decided to throw some together, based on what was already in the fridge. I created my Immune Boosting Soup. It tasted delicious, I will definitely be making it again. Read to the end to discover the health benefits of the ingredients that I used as well as a copy of my free Superfood E-Book. Spig’s of Parsley (from the garden) for Garnish. Firstly, I washed and roughly chopped the vegetables, ginger and garlic. Then I heated the Coconut Oil in the pan. I put all the Veggies, the Garlic and the Ginger into the pan and cooked them for a few minutes until they were soft. Then I added the Cinnamon, Turmeric, Lemon Rind, Salt and Pepper, which I stirred through the softened veggies. I added the Lemon Juice and Bone Broth, which I defrosted because I had made it earlier, and brought it to the boil. I let it simmer for about 40mins. 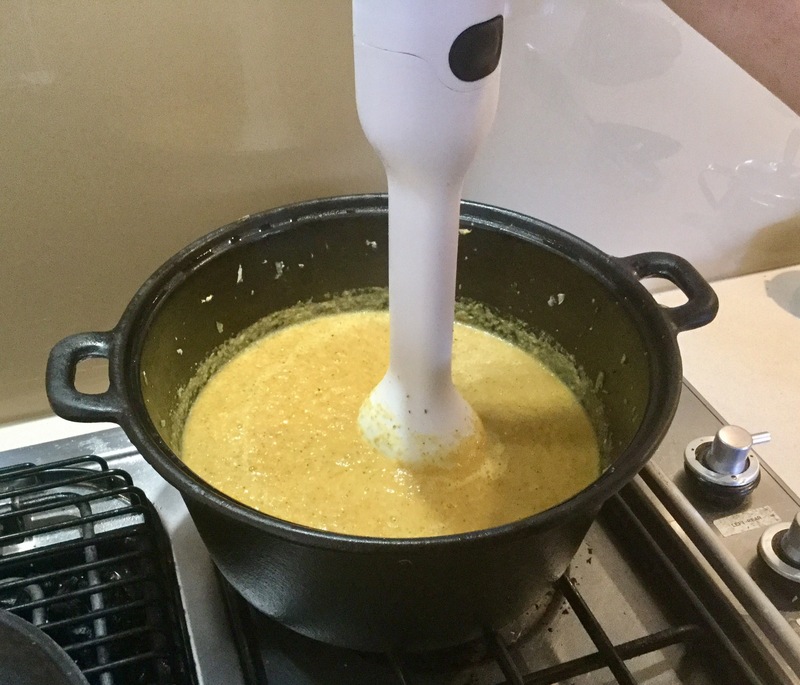 Finally, I blended the soup with my hand-held blender, to a smooth consistency. I served with a garnish of Parsley and a couple of slices of buttered Multigrain Sourdough. Immune Benefits Of The Ingredients In My Immune Boosting Soup. Carrots contains heaps of beta carotene, which is a powerful phytonutrient that helps make the natural killer cells and T cells in your body. These cells are the army in your body that fight off and kill nasty disease carrying microbes. Celery contains antimicrobial properties that are harmful to bacteria that cause infections. It also contains antioxidants and polysaccharides that are known to act as anti-inflammatory in the body. Broccoli which is considered to be a superfood, contains a chemical called sulforaphane which switches on antioxidant genes and enzymes in some of your immune cells. These then combat the damage that free radicals cause to your cells. One study by UCLA researchers, showed that sulforaphane is capable of stimulating a wide range of antioxidant defence pathways and may be able to interfere with the age related decline in the immune system. Onion contains quercetin which can help break up the mucus in your head and chest and boy did I have lots of mucus! Kale one of my favourite leafy greens is also a superfood and contains both Vitamin A and Vitamin C, which are important for the immune system as they enhance antibody responses. Ginger gave the soup a spicy kick which I liked. After, I also thought I could have added some chili too. The spicy kick comes from shogaols and gingerols, two chemicals which also helps to remove the mucus by encouraging coughing and stimulating the blood circulation which then opens the sinuses. Garlic contains sulphur enzymes and has been known for many years to be powerful against the common cold. Clinical studies show beneficial effects on macrophages and T-Cells which help fight disease in the body. It also has anti-viral and anti-fungal properties. 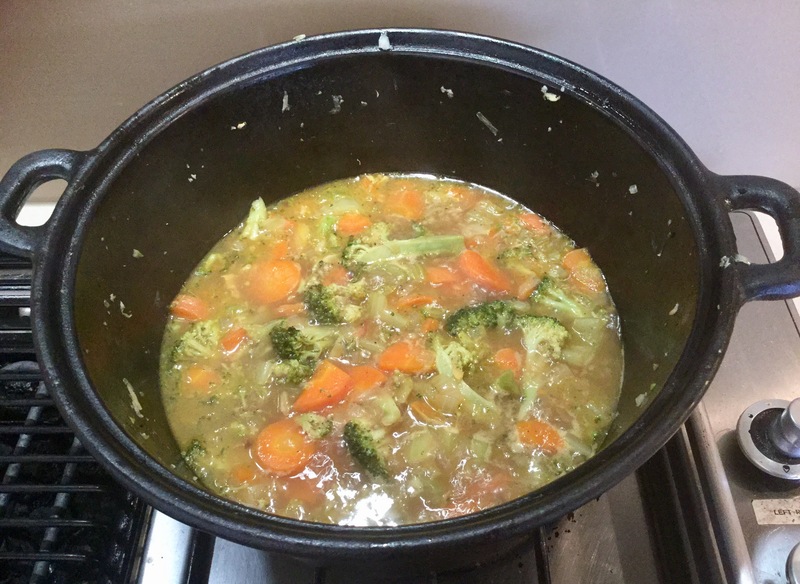 Coconut Oil is a wonderful healthy fat, which added a slight coconut flavour to my soup. It contains lauric acid and caprylic acid which are known for fighting off bacterial infections. Turmeric work beautifully together with Black Pepper to fight many things including inflammation. Turmeric is also known as Curcumin and it gave my soup the golden yellow colour. It has anti-inflammatory properties, is a powerful antioxidant and has anti-bacterial and anti-viral properties. Black Pepper should be used in conjunction with Turmeric because it increases Turmeric’s bio availability. Piperine is the chemical in Black Pepper which has also health benefits. Black Pepper can trigger transient receptors in the body to reduce pain. It has anti-inflammatory properties and can help reduce sinusitis and nasal congestion. Cinnamon contains many flavonoid compounds for fighting inflammation. It is also packed with protective antioxidants called polyphenols and phenolic acid making Cinnamon a natural anti-microbial, , anti-biotic, anti-fungal and anti-viral agent. Bone Broth. The slow simmering process causes the bones and ligaments to release all their healing compounds. Amino acid, collagen, minerals and fat-soluble vitamins are all released to help reduce inflammation and boost the immune system. Excellent also for gut health. Lemons are packed full of Vitamin C and flavonoids. Lemons have been known to boost the immune system for years and is found in many cold and flu remedies. Its anti-bacterial properties mean it can also help with throat infections. Parsley can be added to the soup or just used as a garnish. It’s worth adding to the soup because it contains flavonoids such as luteolin which has been shown to function as an antioxidant. In addition, Parsley contains Vitamin C, which we already know is great for boosting the immune system. We both enjoyed our soup and there was enough left over to have a bowl the next day. Please share your own healthy soup ideas below in the comments, as well as any ideas to add variety to my immune boosting soup.